I liked them very much, but they were somewhat expensive (~€20-30 for a big plate), so I bought several of them, not as much as I wanted. 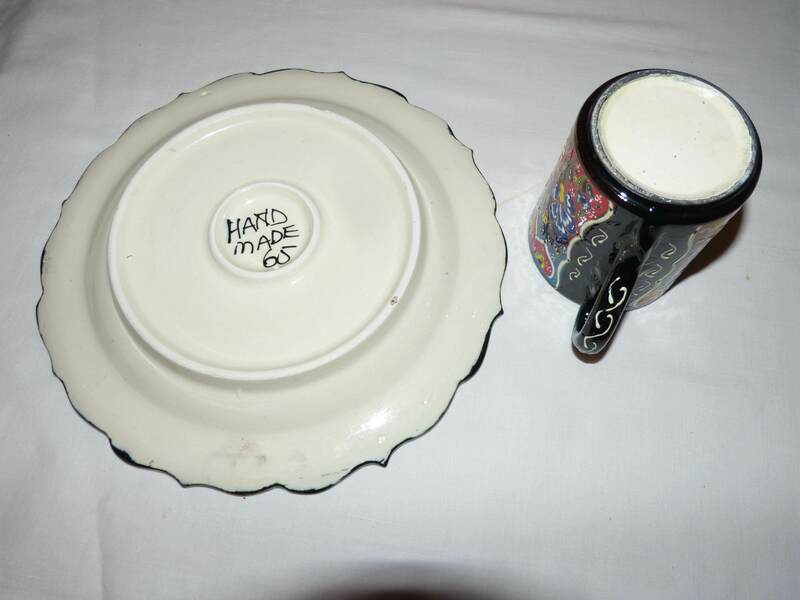 They bear no maker's mark of any kind (except for "Hand made 65" on one of them, shown on the photo above). Later I saw them in one souvenir shop in my home city of Nizhny Novgorod, Russia (the shop specializes on `souvenirs from all over world'), but there were only a few of them and also expensive (approximately the same price). Now I am on Cyprus, and here similar items are in each souvenir shop. Slightly cheaper, but not much cheaper. 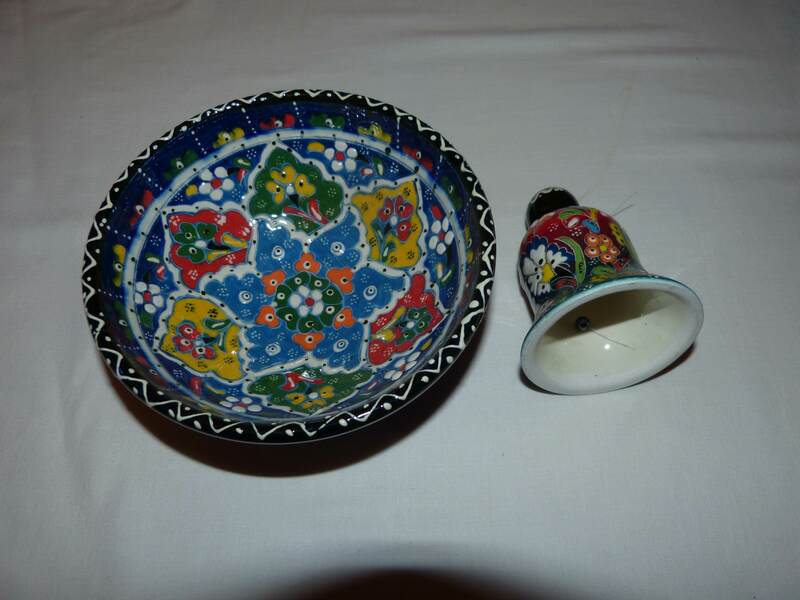 After some googling, I find that this may be called Turkey Iznik ceramics (e.g., 1, 2), although Wikipedia page in Iznik pottery have no images of specifically this style, all images there are of a similar, but different style. I also remember finding some article on the Internet saying that Istanbul markets have a lot of such items for a really low prices, but I can not find that article now. I will probably be in Istanbul next year, and was hoping that on some market I will find the same items, but much chaper than in souvenir shops, as the latter are always overpriced. Is that name Iznik ceramics/pottery correct? If not, what is the proper name for the items of this style? If yes, is there any more specific name? Can I buy them somewhere cheaper than in the shops where I have seen them? What typical prices should I expect? Note that I am not speaking about authenticity, originality or whatever, all I want is to buy quality items of such style; that is if the items of this style are produced in several places nowadays, I do not mind which of them is `original'. Also I am not interested in similar, but different styles such as shown in Wikipedia article on Iznik pottery, or Uzbek pottery etc. Iznik ceramics/pottery is one of the correct names, but Kütahya ceramics is more common nowadays. In addition, you can simply use the Turkish word çini to buy one in Turkey. The capital of ceramics in Turkey is Kütahya Province. They are most probably made in Kütahya. Production in Iznik (Bursa Province, Turkey) almost died after 18th century. The plate on the second image approximately costs €15. 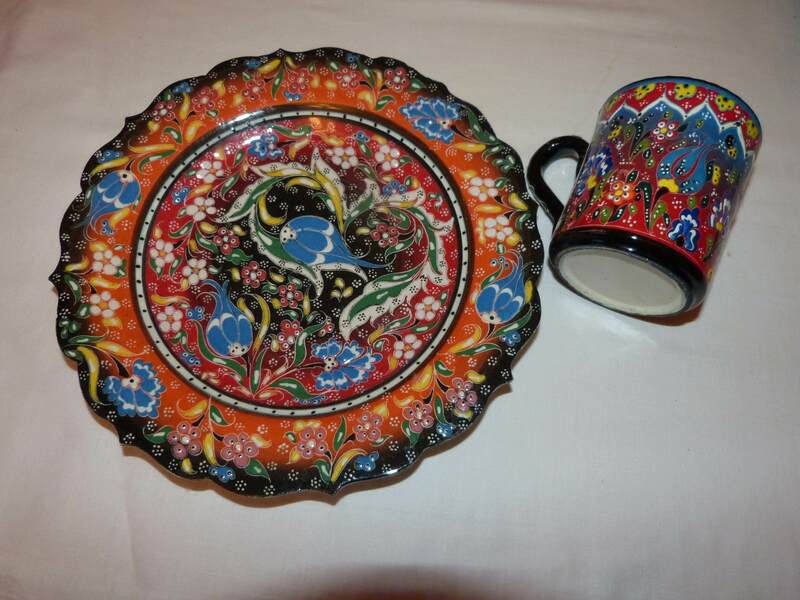 Extra information: Since tulip and clove flowers are commonly used on Turkish ceramics, the plate on the second image is more recognizable for me. Not the answer you're looking for? Browse other questions tagged turkey identify-this cyprus montenegro souvenirs or ask your own question.